Hedgehogs have a keen sense of smell that is very useful to them in search of food and detecting danger. Their nose is warm and moist and a curious hedgehog will have their snout in the air sniffing, in order to gather information from it’s environment. At the slightest threat of danger (usually detected by noise or movement) they will duck their head for protection. Placing a T-Shirt that you’ve slept in, over your hedgehog’s cage, is one of the simplest ways for you to bond. The hedgehog will associate your smell as part of it’s environment. Another way to incorporate your smell with your hedgehog, is to sleep with your hedgehog’s sleeping bag. Again, the hedgehog will associate your smell with a comfortable place. Some people take fleece and cut it into two-inch squares and tuck those fabric squares into their clothing. Many hedgehogs have been known to carry around these little squares like security blankets. Holding your hedgehog and allowing it to snuggle into your arm or fall asleep on you is an excellent form of bonding. Your hedgehog will appreciate your warm body and the comfortable place to snuggle. 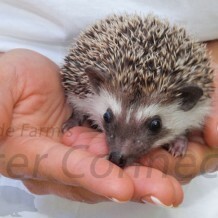 Your goal is for your hedgehog to associate your scent with comfort or something that is pleasant. For instance when our kids come into the house and smell chocolate chip cookies they immediately think they’re going to have a tasty snack. They associate that smell with something good. Similarly with hedgehogs, they will associate your smell with something safe.